Home / Beauty / body / expiration / hair care / makeup / nail / shelf life / skincare products / Beauty, Makeup and Other Skincare and Wellness Products’ Shelf Span: When to Toss Them Away! Beauty, Makeup and Other Skincare and Wellness Products’ Shelf Span: When to Toss Them Away! Beauty and wellness products such as makeup, hair and body items as well as toiletries are still considered as consumable items because they are being applied and absorbed by the largest part of our body, which is the skin. And being consumable items, they also have their own shelf life or expiration dates that you have to be aware of. Well, others may argue, why not since you don’t literally eat them or will not make you sick when you put them even if they've already expired. Well yes you don't really take them orally but take note though of bacteria buildup and other harmful effects like breakouts and skin irritation when you put them on. Expiration dates act as a guide for product’s safety. Some beauty products, if improperly stored especially if there is a direct exposure to sunlight and high temperatures may expire long before the expiration date. That also is true if it has been substantially opened and examined by consumers prior to purchase so the deterioration will even be earlier. There are also products that can last longer than the expected expiration dates if they are sealed and stored properly like those with pump dispensers as it is less exposed to air compared to those with wide lids. You have to understand though that not all cosmetics companies put labels on their products when it will specifically expire because they are not required by the law. Thankfully, there are some that indicate the expiration dates for us consumers to check. 1. For liquid foundation, they usually last six to 12 months. 2. 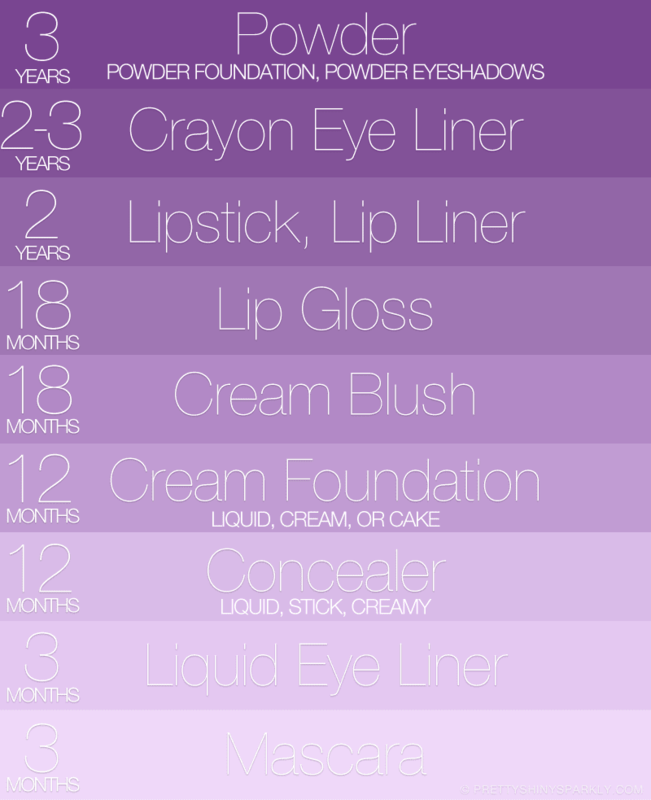 Cream foundation has a shelf span from four to 12 months. 3. Foundation that goes with a pump dispenser usually lasts longer because there is a lesser air exposure compared to those in jars and wide brims. 4. Highly pigmented foundations like mineral makeups usually lasts a year. Take note: If you see that the pigments or layers and even the oil had separated or it smells sour, then you have to let go. 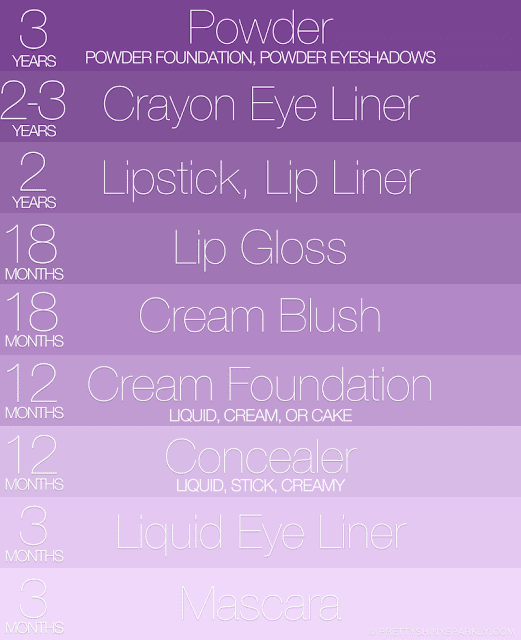 One year to 18 months shelf life for lip gloss while 12 months-24 months for lipsticks. Take note: If the lipstick is super dry and flaky or if it turns oily when used,, then you definitely have to buy a new one. These makeup items can last over a year so long as there is continued use and sharpening. Liquid eyeliner will last for three months. Take note: If they crumble, then it’s time to throw them away. They have longer life span.For powder blush and eye shadow they usually stay from 2-3 years. Cream blush though will be up to 18 months. Take note: If they tend to be flaky, then it’s time to throw them out. Proper cleaning of brushes and eye shadow applicators will help a lot to prevent bacteria buildup. Also there are a lot of disposable brushes and applicators nowadays so that’s an added bonus. They can last from 2-3 months. It is best not to pump or double-dip your mascara as air just pushes back into the tube. Take note: I suggest that you use a disposable applicator so you can easily toss them especially if other people will use it. You can clean your applicator wand with tissue every couple of days as well to prevent clumping. The shelf life ranges from 6-12 months. The brushes should be washed regularly (once a week at least) with mild soap and warm water. I’ve read that it’s good to either use mild hair shampoo or it can also be some baby soap. Sponges on the other hand should be cleaned every after use. And if you see it is soiled with wear and tear, then buy a new one. They have up to six months shelf life unless it is stated on the label that it takes longer than that. Take note: Facial cleansers that contains glycolic acid, salicylic acid, and beta hydroxyl acid normally have a longer shelf life so again it’s good to check the labels if expiration dates are specified. It will last a year. This usually has a shelf life of 6-12 months. But bath sponges? Try to change them as soon as they look soiled. It will normally last until 2 years. But if it is already super oily or sometimes watery and the smell is different, then throw it away. This product normally lasts 1-2 years. Take Note: You can easily spot if it's expired already if the oil and the color/pigment separated and that they won’t blend even if you shake it. Nail polish thinner is the best way to revive a flaky or dried bottle of nail polish than the acetone usage. It is even helpful to add longevity to the product. From 8-10 years depending on the oil used. Take note: Store them in a cool, dark place for longevity. If the smell is already different or the color lightens already, then it reached its deterioration stage. They usually last longer than the body and skincare products; normally will take up to 3 years of shelf span. Usually these hair products DO have expiration dates so it’s easier to know when to let go. The great news is, they don't have shelf life, so long as they are well maintained and taken cared of properly. For a makeup junkie like me who has a lot of stash on her makeup bag, sometimes it is very hard to let go of my favorite products especially if I am used to seeing them around, even those items that I have saved to be used for special occasions only and ended up not being able to use that much or because of their lovely colors and packaging so even if I knew that they are expired already, I still want them around for my eyes to feast. Yeah, it’s hard to let go--- but I have to - you have to; not only to prevent breakouts, bacterial buildups and skin irritation but also for sanitation purposes. It is great then to be aware of how long will items or products last especially those that do not have any expiration dates on their labels so it will be easier to determine until when can you use them. Although I’m pretty sure that if it is your favorite product or brand, then it usually is long gone without even reaching the expiration date. And lastly, sharing is great, but not with makeups as germs and bacteria can be transferred so easily by makeup sharing; thus, can cause breakouts and other skin problems. So as much as needed, if there’s something that you have to keep yourself, please don’t share your makeup. If not, then make sure that you follow tips that I mentioned on some of the items I discussed earlier.So since you already know, why don't you rummage your kit and start checking your makeups? Have fun!